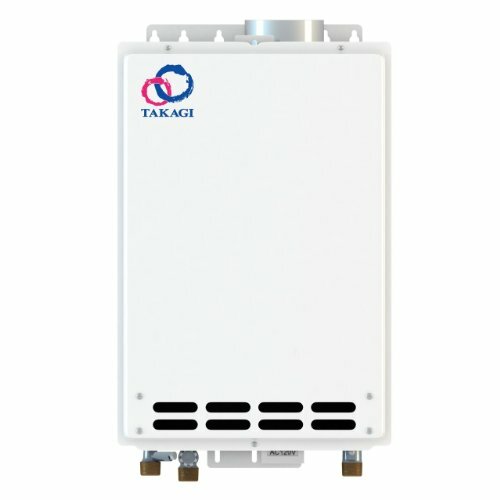 If you’re ready to say goodbye to cold showers and need a newer, better solution for your home’s water heating needs, then it’s about time you got yourself a tankless water heater. We know, most are used to that big, ugly, metal thing covered in cobwebs to do their water heating but it’s time to move into the new age. We’ve created the best tankless water heater guide out there so that you can join the rest of us in 2018 with savings on energy costs and upgraded technology. The benefits of this decision are numerous just as you’re about to see. 1 Top 5 Rated Tankless Water Heaters: Which one is the Best? 2 Why use a tankless water heater? 3 What to Look for When Buying One? 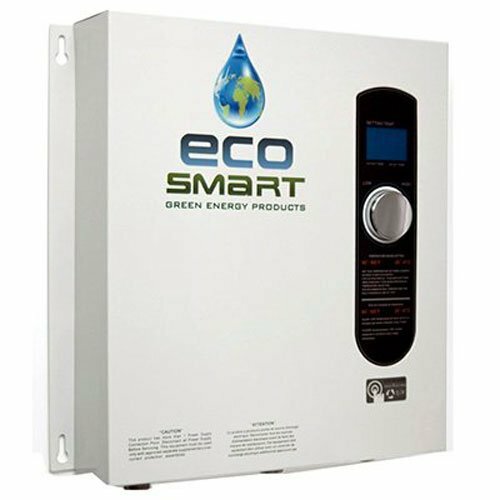 If you want to know who our favorite water heater is right away, look no further than the Ecosmart ECO 27. We love the versatility that the ECO line of products brings to work specifically for every home size. We also have found that customer reviews on it are extremely high. Everyone loves the constantly hot water (and how soon it shows up after they ask for it) and that’s why we have chosen it as our top water heater for your consideration. Top 5 Rated Tankless Water Heaters: Which one is the Best? This heater can provide hot water at a rate of up to 3 gallons per minute. That means that you would have to turn on just about every hat water user in your house all at the same time to start to see a drop in temperature. This unit comes with a remote control that can be used to control the temperature of the water it puts out. This can be done to within one degree of accuracy meaning you get exactly the heat you want. Dependable and long-lasting, copper and stainless steel make up the most active components of these water heaters. The high quality of these materials is something that you would enjoy in the coming years when you don’t have to call the maintenance guy. A couple things that the Ecosmart are missing are, first, a more thorough warranty plan. Customers have left reviews that aren’t exactly desirable in this regard. Another difficult point about these heaters is that they have a lot of different sizes and finding the right one may prove difficult. This tankless water heater has gauges for temperatures on both its inlet and outlet. This is great because it will give you an idea of the water coming in and water going out so you know if there are any problems with your unit. Ensure that you won’t be running out of hot water ever again with this Takagi product. 6.6 gallons of hot water every minute are enough to keep your water hot despite having every hot water appliance running at the same time. Having earned an Energy Star certification, this product is certain to save you money on your home’s energy bills. You may be having to buy something right now but you’ll be saving later. So, this purchase is more of an investment than a regular one. As far as where this product comes up short, the fact that it uses gas may be something you don’t particularly like. While it is more efficient than a water heater with a tank, you may choose to go for an electric water heater if you want to avoid using gas altogether. This helpful heater is compact enough to fit right under a sink to make it a hot water sink. Just install it, plug it in, and you’ve got hot water. As simple as this sounds, you’ll love the convenience that you get out of a localized water heater. Because the parts in this electric water heater are durable (the mini-tank it has is glass-lined), you’ll get to enjoy this purchase for years and years to come. 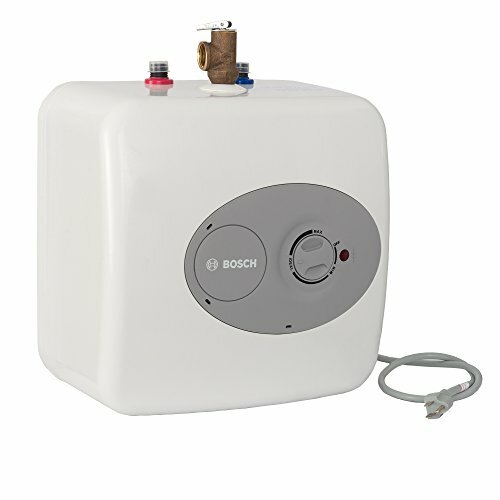 Wherever this Bosch heater gets installed, you won’t need to worry about a lack of hot water anytime soon. No more dreaded waits for hot water when you want it immediately. This water heater works perfectly to supply up to 2 sinks at one time with awesome hot water – and on demand. Say goodbye to waiting for hot water to show up out of your spout. Now, something you may not like about this water heater is that it isn’t necessarily meant to replace your existing water heater. Rather, it is meant to augment its performance to get you better hot water. Another thing that is different about this heater compared to others is that it works through a plug in the wall like many other electronics you interact with every day. Easily know the temperature of the water that your heater is producing. The front of this product has a digital, simple to read LED display that can be used to gauge your water temperature. And it is always within one degree of accuracy. The most impressive feature of this unit is that it adjusts its heat output for its usage and the water that is coming into it. 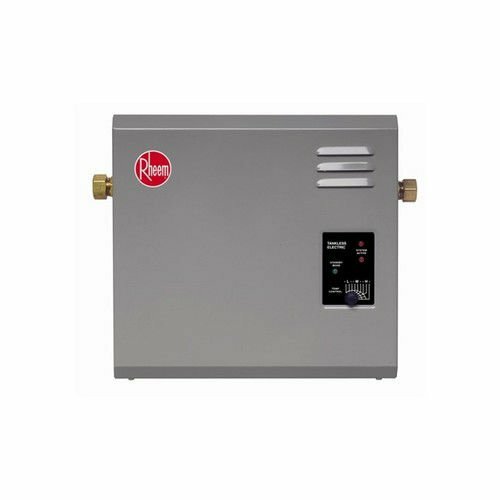 In this way, the Rheem tankless heater will get you extra efficiency and extra energy savings. That’s something that not many other water heaters can say about themselves. All you need to put up this heater in your house is 3/4” NPT water connections. If you (or someone you know) is handy, putting in this water heater is as simple as feeding a few threads correctly. This is great for if you don’t want to pay for a plumber to install it. If you’re looking for an exterior unit, this Rheem product isn’t going to be the one for you. This product is only meant for interior installation and would freeze up in cold, winter climates. But, if you weren’t worried about that in the first place, no worries! That’s right. 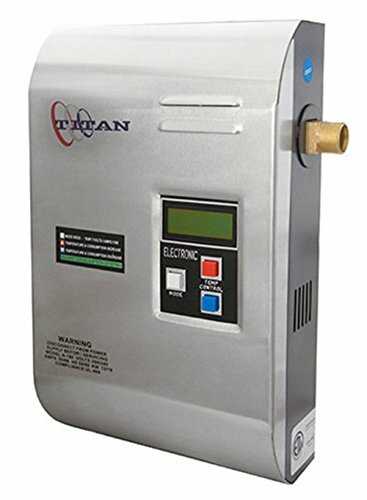 If you are looking for the most energy savings on water heating, Titan has you covered. They can help you save up to two-thirds of your hard earned money on these costs. For this reason, getting a tankless water heater may even just pay for itself. This water heater is awesome for getting the water warmed up and going for every sized home. It has the power to get 65-degree incoming water heated for these sized homes and provide that water quickly. You’ll never have to wait for the shower to heat up again. For how powerful this unit is, you would never guess how compact it is. It’s only 10 inches by 4 inches by 8 inches. That means you can fit it into wherever you need to in order to replace your oversized normal water heater. The only drawback that we could find for this unit was that it is not exactly the most tried and true product out there. It is made by a smaller company and doesn’t have as many reviews as competitors. This may feel like you’re being risky but the fewer reviews that are out there say that this Titan product is a good buy nonetheless. Why use a tankless water heater? A tankless water heater, like a water heater with a tank, gets water hot for use throughout the home. However, a tankless water heater is far, far more efficient than a traditional water heater. Why? Because a traditional water heater loses tons of heat while it holds the water. A tankless water heater doesn’t do this. Instead, it heats up water only as it is demanded so that the heat that it produces doesn’t get lost. Instead, it gets sent right through the pipes and out to you. What to Look for When Buying One? First and foremost, you must make sure that the water heater you buy fits your home. 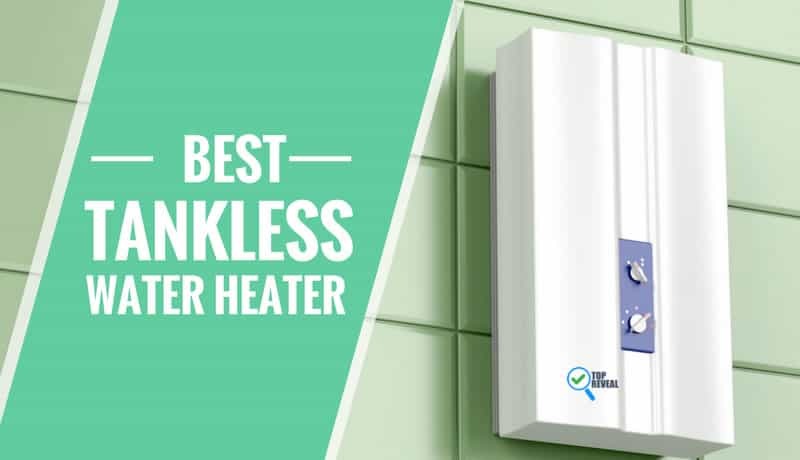 The best tankless water heater for Home guide in the world doesn’t help you any if you don’t make sure that the water heater that you get doesn’t work with your existing piping and power supply. With this in mind, you should also look to make sure that the heater you get puts out enough heat to handle all of your hot water demand needs. If you are going to be asking for more than a few gallons per minute, you should be checking to see that the heater you choose is up to the task. Additionally, you should make sure that the heater you choose gets hot enough for your liking in the first place. Q: How hard is it to operate a tankless water heater? A: Nearly all tankless water heaters are extremely easy to operate. Most will feature a digital LED read-out that shows you the temperature of the water that is being put out. Other than pushing a button or two for temperature adjustments, you probably won’t need to interact with your tankless water heater much. For that reason, one of these are easy to operate. Q: Are tankless water heaters safe? A: Tankless water heaters are definitely safe. In fact, odds are that they are far safer than traditional water heaters. Most traditional water heaters use gas while most tankless water heaters simply use electricity. For this reason, there is a much lower chance of anything bad happen with a tankless water heater when comparing to a traditional water heater? Q: Why are tankless water heaters more energy efficient? A: Tankless water heaters are more efficient than traditional ones for one easy reason: heat loss. A traditional water heater allows the heat that it creates to get lost while the water is sitting in its tank. This means that energy that it produces gets almost immediately lost, unfortunately. With a tankless water heater, there is extremely little heat loss because the water doesn’t sit after it gets heated. It simply gets sent through your home’s pipes and out to you. To cap off the best tankless water heater guide you’ll find, we want to leave you with a thought. What if there came a technology that was more energy efficient, safer, affordable, and more environmentally friendly than all its competition – and was available to improve your home? Would you seize that opportunity? Well, with tankless water heaters around, that very capability is possible. Improve your home’s water heating today by getting the Ecosmart ECO 27 when you demand it and right at the right temperature. Keep it Cool: Best Tower Fan Comparison Reviews (2019) You Can Count On!